People of all times and cultures have believed in false and dubious ideas. This is just as true of our modern scientific age as it was of earlier cultures – we too believe in all sorts of ungrounded causal statements, like such and such a practice can lead to a longer life, to better health and so on. How can such beliefs be explained? Boudon examines the main theories that have been used in the social sciences and psychology for the explanation of beliefs. He then develops a particular model which enables him to show that actors often have good reasons to believe in false ideas. The central idea of this model is that actors often draw controversial conclusions from valid arguments because they introduce implicit statements which they do not perceive, since they treat them with good reasons as self–evident. Hence they can hold doubtful or even false conclusions and regard them as solidly grounded. Boudon shows that this model can be used to reinterpret many findings from the sociology of religion and the sociology of knowledge, as well as from cognitive psychology. It can also show how scientific arguments can lead to false or fragile beliefs – in short, beliefs in false ideas are often grounded in serious arguments. 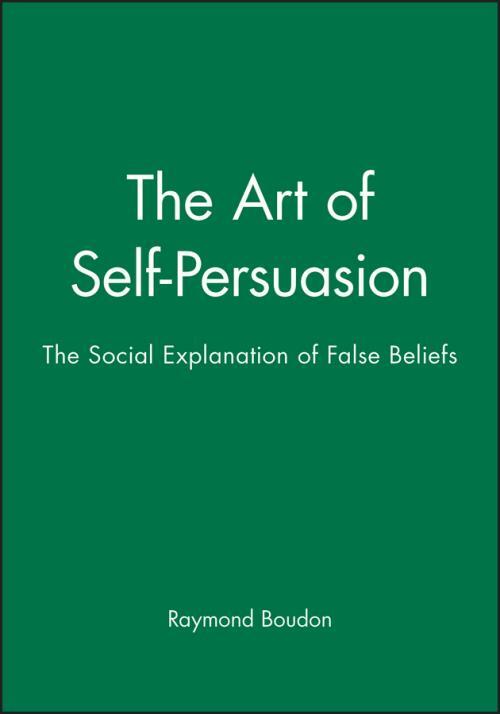 The Art of Self–Persuasion is a major contribution to the analysis of beliefs. Moreover, through the elaboration of the notion of ′good reasons′, it also makes a significant contribution to the theory of rationality. 1. The Powers that Induce us to Agree. 2. Good Reasons for Believing in False Ideas. 6. No Effect Without Cause. 9. Reason with a Small. 10. Simmel and the Theory of Knowledge.